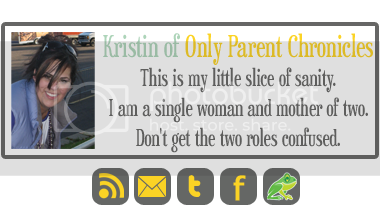 Only Parent Chronicles: Share a Spoon - It's a Cookie Swap! 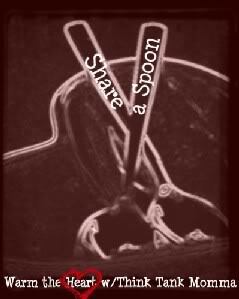 Share a Spoon - It's a Cookie Swap! It's Thursday! You know what that means! Head on over to the Think Tank and link on up! This week, it's a COOKIE SWAP! If you're anything like me, gift giving seasons put a strain on the pocket book. It seems that finding an affordable gift that has any value can be very difficult. and quite frankly, it gets frustrating. One way to give a gift of value with a small price tag is to make your own. 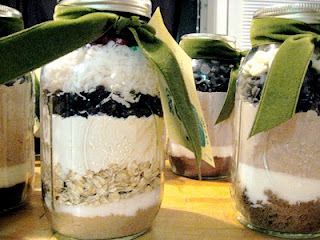 I like to give cookie mix jars! ﻿Layer all of the ingredients into the wide mouth canning jar in the order listed. Pack each layer down FIRMLY! You can decorate the jar by securing a 9" circle of fabric over the lid. You can secure the fabric with a rubber band and cover the elastic with ribbon or raffia. Empty jar of cookie mix into a large mixing bowl. Add 1/2 cup of butter or margarine, 1 egg, and 1/2 teaspoon of vanilla. Use hands to mix the wet and dry ingredients together. When completely blended, roll into large walnut sized balls. Place on unprepared cookie sheets and use the palm of your hand to flatten each cookie ball. Bake at 350 in a preheated oven for 8-10 minutes. Photo from Google images... It's been a busy month. Don't judge me. Hahaha! I have never done Butterscotch cookies, definitely going to try! These jars are beautiful! I love giving (& receiving!) homemade gifts! I will probably do some of these for Christmas. Oh, this is such a great idea!! I love this, I think that this would be such a good teacher Christmas gift. I am going to bookmark this for sure. 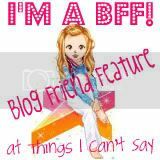 I'm visiting and a new follower via Shell :) I'm going to poke around your blog some more! Butterscotch chips are my flavorite! This is so exciting. I always thought those made the best gifts and these sound yummy! You lost me at COCONUT. But they sure look purty! Wow! What a great idea and they look delectable! I will definitely be trying THIS one out! I have been thinking baked goods are the go to gift this year. We don't see anyone often enough to know what they would really like and I hate getting the generic bath gift sets (unless it's Bath & Body Pomegrante mmmm) so I want to give things I know people will love. Food. Everyone loves food! I do this too. I love it. Easy and even my four year old can help out...here's another. Mix up a few drops of essential oil with Epsom salts. Add a few drops of food color, put it in a canning jar (I use jelly jars). Let it sit for two days for the scents to settle. Ta-Da! What a great idea! and that recipe sounds SOOOOO good! Mmmm... my kids (okay, I) LOVE butterscotch. Thanks for the recipe! I just read your whole "story"-- all 5 parts-- and my heart goes out to you, girl. You are so strong...and it's so great how you've picked up the peices of your life. You're in my prayers. Ooo nice! I am a big fan of cookies.